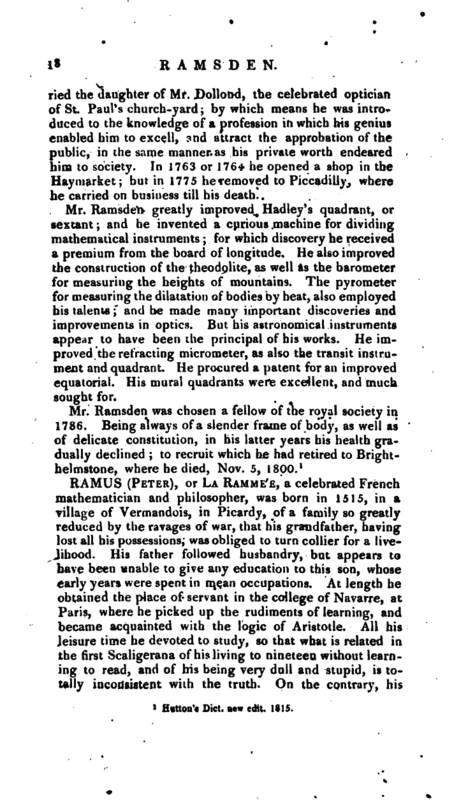 , or La Ramme‘E, a celebrated French mathematician and philosopher, was born in 1515, in a village of Vermandois, in Picardy, of a family so greatly reduced by the ravages of war, that his grandfather, having lost all his possessions, was obliged to turn collier for a livelihood. His father followed husbandry, but appears to have been unable to give any education to this son, whose 4 arly years were spent in mean occupations. At length he obtained the place of servant in the college of Navarre, at Paris, where he picked up the rudiments of learning, and became acquainted with the logic of Aristotle. All his leisure time he devoted to study, so that what is related in the first Scaligerana of his living to nineteen without learning to read, and of his being very dull and stupid, is totally inconsistent with the truth. On the contrary, his | talents and perseverance at last procured him to be regularly educated in the college, and having finished classical learning and rhetoric, he went through a course of philosophy, which took him up three years and a half. The thesis which he made for his master’s degree denied the authority of Aristotle, and this he maintained with great ability, and very ingeniously replied to the objections of the professors. This success inclined him to examine the doctrine of Aristotle more closely, and to combat it vigorously: but he confined himself principally to his logic. 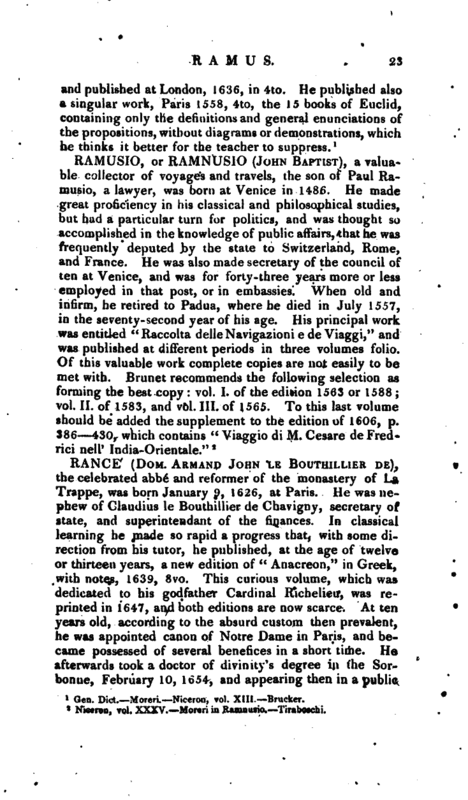 All this, however, was little less than heresy; and the two first books he published, the one entitled “Institutiones Dialecticae,” the other “Aristotelicse Animadversiones,” so irritated the professors of the university of Paris, that, besides many effusions of spleen and calumny, they prosecuted this anti- peripatetic before the civil magistrate, as a man who was at war with religion and learning. 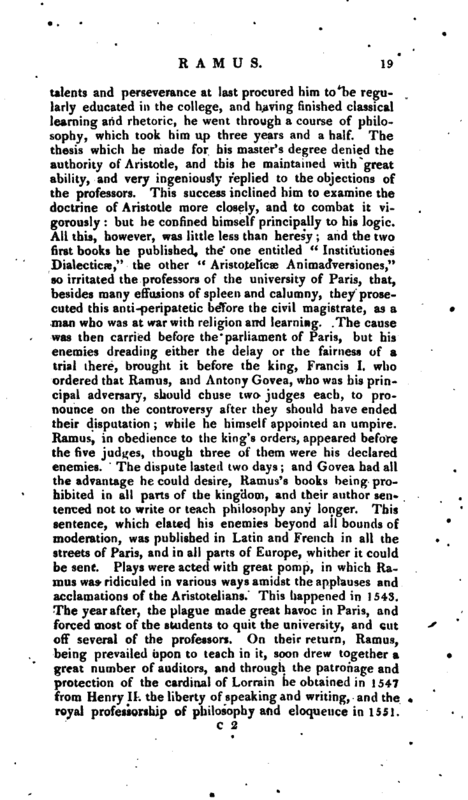 The cause was then carried before the parliament of Paris, but his enemies dreading either the delay or the fairness of a trial there, brought it before the king, Francis I. who ordered that Ramus, and Antony Govea, who was his principal adversary, should chuse two judges each, to pronounce on the controversy after they should have ended their disputation; while he himself appointed an umpire. Ramus, in obedience to the king’s orders, appeared before the five judges, though three of them were his declared enemies. The dispute lasted two days; and Govea had all the advantage he could desire, Ramus’s books being prohibited in all parts of the kingdom, and their author sentenced not to write or teach philosophy any longer. This sentence, which elated his enemies beyond all bounds of moderation, was published in Latin and French in all the streets of Paris, and in all parts of Europe, whither it could be sent. Plays were acted with great pomp, in which Ramus was ridiculed in various ways amidst the applauses and -acclamations of the Aristotelians. This happened in 1543. The year after, the plague made great havoc in Paris, and forced most of the students to quit the university, and cut off several of the professors. On their return, Ramus, being prevailed upon to teach in it, soon drew together a great number of auditors, and through the patronage and protection of the cardinal of Lorrain he obtained in 1547 from Henry II. the liberty of speaking and writing, and the royal professorship of philosophy aad eloquence in 1551. | The parliament of Paris had, before this, maintained him in the liberty of joining philosophical lectures to those of eloquence; and this arret or decree had put an end to several prosecutions, which Ramus and his pupils had suffered. As soon as he was made regius professor, he was fired with new zeal for improving the sciences; and was extremely laborious and active on this occasion, notwithstanding the machinations of his enemies. He bore at that time a part in a very singular aflair, which deserves to be mentioned. About 1550 the royal professors corrected, among other abuses, that which had crept into the pronunciation of the Latin tongue. Some of the clergy followed this regulation; but the Sorbonnists were much offended at it as an innovation, and defended the old pronunciation with great zeal. Things at length were carried so far, that a clergyman who had a good living was ejected from his benefice for having pronounced qm’squis, quanquaw, according to the new way, instead of kiskis, kankam, according to the old. The clergyman applied to the parliament; and the royal professors, with Ramus among them, fearing he would fall a victim to the credit and authority of the faculty of divines, for presuming to pronounce the Latin tongue according to their regulations, thought it incumbent on them to assist him. Accordingly they went to the court of justice, and represented in such strong terms the indignity of the prosecution, that the person accused was acquitted, and the pronunciation of Latin recovered its liberty. 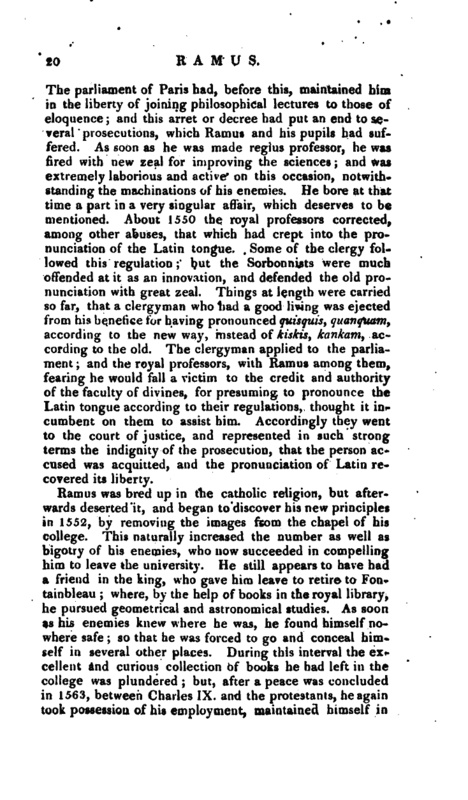 Ramus was bred up in the catholic religion, but afterwards deserted it, and began to discover his new principles in 1552, by removing the images from the chapel of his college. This naturally increased the number as well as bigotry of his enemies, who now succeeded in compelling him to leave the university. He still appears to have had a friend in the king, who gave him leave to retire to Fontainbleau; where, by the help of books in the royal library, he pursued geometrical and astronomical studies. As soon as his enemies knew where he was, he found himself nowhere safe; so that he was forced to go and conceal himself in several other places. During this interval the excellent and curious collection of books he had left in the college was plundered; but, after a peace was concluded in 1563, between Charles IX. and the protestauts, he again took possession of his employment, maintained himself in | it with vigour, and was particularly zealous in promoting the study of the mathematics. This lasted till the second civil war in 1567, when he was forced to leave Paris and shelter himself among the protestants, in whose army he was at the battle of St. Denys. Peace having been concluded some months after, he was restored to his professorship; but, foreseeing that the war would soon break out again, he obtained the king’s leave to visit the universities of Germany. He accordingly undertook this journey in 1568, and received much respect and great honours wherever he came. He returned to France after the third war in 1571; and lost his life miserably, in the massacre of St. Bartholomew’s day, 1572. Charpentaire, a professor of mathematics, who had been eclipsed by the superior talents of Ramus, seized the opportunity of being revenged upon his rival, and employed assassins to murder him. 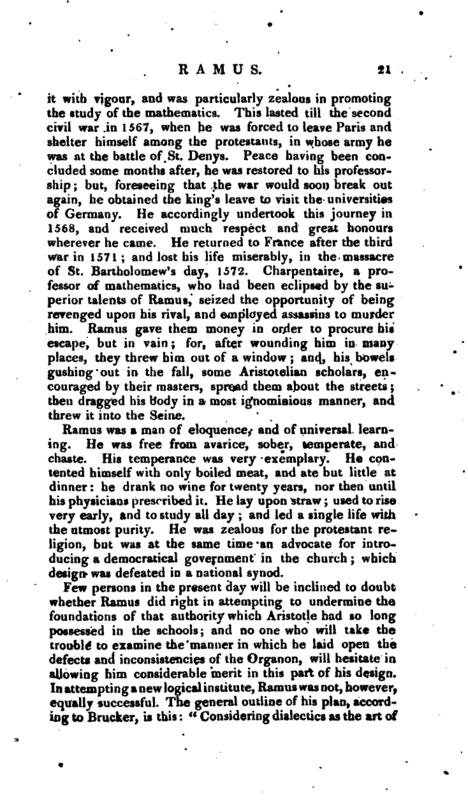 Ramus gave them money in order to procure his escape, but in vain; for, after wounding him in many places, they threw him out of a window; and, his bowels gushing out in the fall, some Aristotelian scholars, encouraged by their masters, spread them about the streets; then dragged his body in a most ignominious manner, and threw it into the Seine. Ramus was a man of eloquence, and of universal learning. He was free from avarice, sober, temperate, and chaste. His temperance was very exemplary. He contented himself with only boiled meat, and ate but little at dinner: he drank no wine for twenty years, nor then until his physicians prescribed it. He lay upon straw; used to rise very early, and to study all day; and led a single life with the utmost purity. He was zealous for the protestant religion, but was at the same time an advocate for introducing a democratical government in the church; which design was defeated in a national synod. 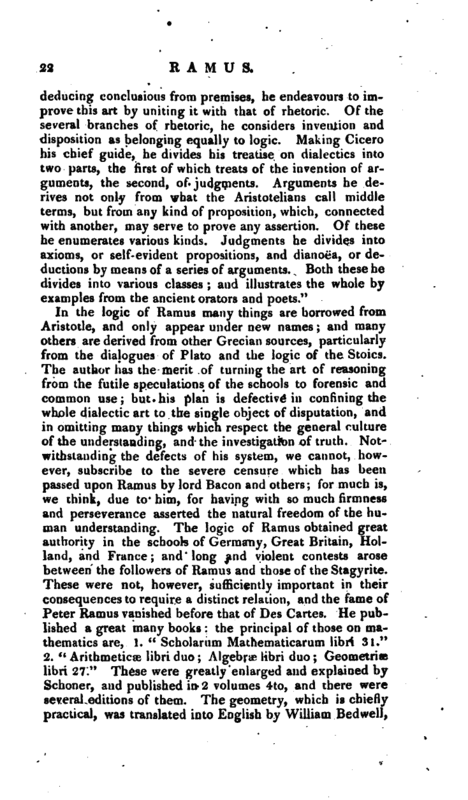 Few persons in the present day will be inclined to doubt whether Ramus did right in attempting to undermine the foundations of that authority which Aristotle had so long possessed in the schools; and no one who will take the trouble to examine the manner in which he laid open the defects and inconsistencies of the Organ on, will hesitate in allowing him considerable merit in this part of his design. In attempting a new logical institute, Ramus was not, however, equally successful. The general outline of his plan, according to Brucker, is this: " Considering dialectics as the art of | deducing conclusions from premises, he endeavours to improve this art by uniting it with that of rhetoric. Of the several branches of rhetoric, he considers invention and disposition as belonging equally to logic. Making Cicero his chief guide, he divides his treatise on dialectics into two parts, the first of which treats of the invention of arguments, the second, of judgments. Arguments he derives not only from what the Aristotelians call middle terms, but from any kind of proposition, which, connected with another, may serve to prove any assertion. Of these he enumerates various kinds. Judgments he divides into axioms, or self-evident propositions, and dianoea, or deductions by means of a series of arguments. Both these he divides into various classes; and illustrates the whole by examples from the ancient orators and poets. Gen. Dict. —Moreri. —Niceron, vol. XIII. Brucker.